What are ‘Analemmas’?… a plot or graph of the position of the sun in the sky at a certain time of day (as noon) at one locale measured throughout the year that has the shape of a figure 8; also : a scale (as on a globe or sundial) based on such a plot that shows the sun’s position for each day of the year or that allows local mean time to be determined. 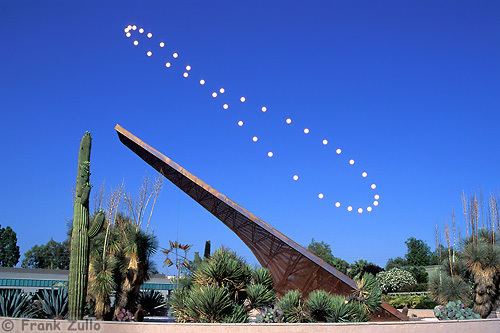 Analemma’s show the position of the sun in the sky over the course of a year, from any fixed position on earth. They can be photographed by setting up a camera to take a photo of the same spot, at the same time, taking multiple exposures throughout the year. Analemma’s were crucial to judging time and were used to construct sun dials in ancient times. Why are Analemmas Hard to Photograph? 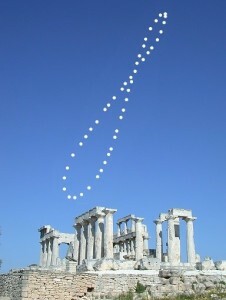 The analemma is considered one of the most difficult and demanding astronomical phenomenon to image. because it is never present all at once. 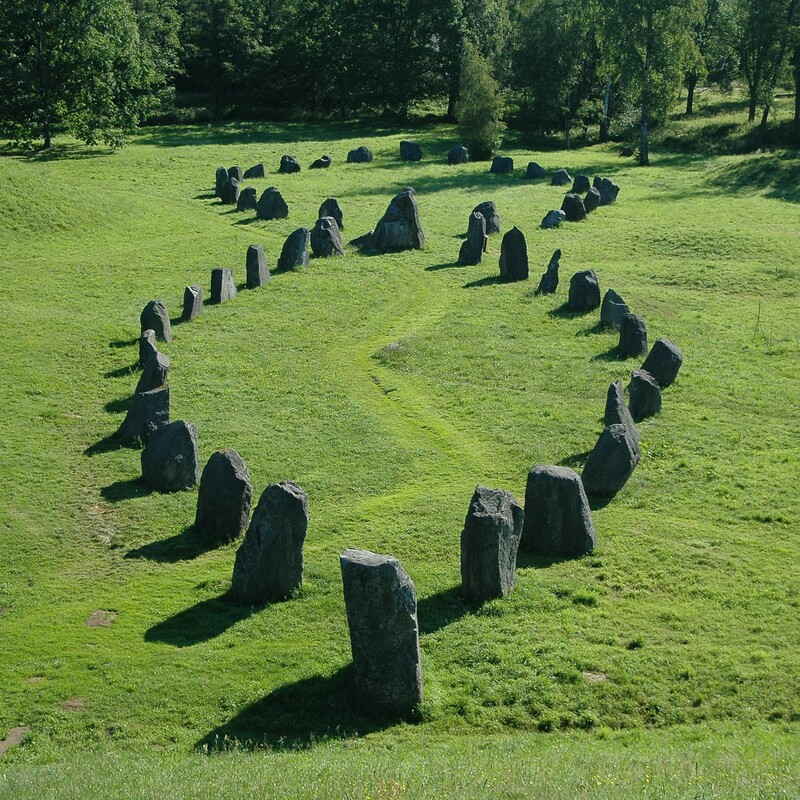 It requires a a virtual image made at the same time of day on 30 to 50 days throughout the year. The analemmas on this page were completed by Anthony Ayiomamitis of Greece (http://perseus.gr), in a marathon started in 2001 to document the complete range of analemmas from sunrise to sunset. These photographs are unique in representing the first analemmas ever imaged during a single calendar year and the first analemmas ever imaged in Greece. The photographer first attached a filter to his camera to block out the extreme light coming from the Sun. This filter also blocks any light coming from the Greek ruins nearby, so only the Sun shows on his film. Then he went to exactly the same spot, at exactly the same time of day, throughout the year, and exposed the same film to the Sun each time (multiple exposures). He made one final trip to take a picture of the Greek ruins, this time without the filter and without the Sun in the sky. CREDIT: Anaemia photographs copyright © 2001-2004, See Anthony Ayikomamitis – http://perseus.gr . All rights reserved.